The looming banking crisis in Italy spells trouble not just for Europe’s fourth largest economy, but also for the EU and an already sputtering global economy, writes Jacob Shapiro for Geopolitical Futures . Jacob Shapiro is the Director of Analysis for Geopolitical Futures, a global analysis company founded and led by George Friedman, an American political scientist, author, and businessman. The European Central Bank sought to calm panic emanating from Italy’s banking sector on 19 January. The previous day, six Italian banks – among them UniCredit and Monte dei Paschi di Siena, Italy’s largest and third-largest banks, respectively – announced that the ECB had requested information as part of its review of non-performing loans (NPLs) held by European banks. ECB officials told Reuters the request for information was not an indictment of those banks in particular; they were merely part of a representative sample. But the ECB’s announcement did little to stem negative sentiments in Italy. Italian banking stocks so far are now down more than 17% since the beginning of 2016. The banking crisis we forecast for 2016 in Italy is coming to a head. It spells trouble not just for Europe’s fourth largest economy, but also for the European Union and an already sputtering global economy. Unlike the concern sparked in November, when four small Italian banks were bailed out, concern over NPLs is now focused on Italy’s largest banking institutions. 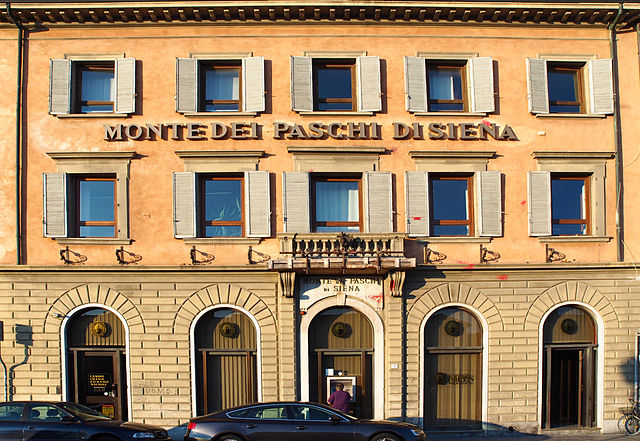 In the spotlight today is Monte dei Paschi. Monte dei Paschi has a reputation for being troubled, having been bailed out twice by the Italian government since 2009. According to the European Banking Authority, approximately 17% of all Italian loans are non-performing. For Monte dei Paschi, this figure is closer to 22%. NPLs and doubtful loans held by the bank total roughly €45 billion, according to Italy24. For some perspective: the four banks that Italy rescued in December held just 1% of Italian bank deposits, and the shareholders affected by their rescue lost about €790 million. Monte dei Paschi’s woes are orders of magnitude greater. Italian bank shares fell across the board over the last two days, but Monte dei Paschi has borne the brunt of the negative sentiment. Shares fell 14.4% today after tumbling 15% on Monday. Monte dei Paschi’s CEO insisted in a statement released Monday that the bank’s health was good and that there was no logical reason for the free fall – a difficult argument to make when you look at the bank’s balance sheet. Italy’s market regulator, Commissione Nazionale per le Società e la Borsa (Consob), took the drastic step of banning the short-selling of Monte dei Paschi shares through Thursday. When China’s regulatory body suspended trading on the stock market two weeks ago as a result of massive plunges, it set off a global crisis of confidence in the Chinese government’s ability to manage its economy. Consob’s suspension of short-selling is not as wide-ranging, but evidently China is not alone when it comes to intervening in a market in an attempt to halt declines. A fourth consecutive day of large declines in Italian bank shares is not the only bad news coming out of the country’s banking sector. According to data released by the Bank of Italy on 18 January, Italians had sold €75 billion worth of bank bonds in the year that ended in September 2015. In Italy, it is not uncommon for bank bonds to be sold to retail investors: According to the Bank of Italy, at the end of 2014, €237.5 billion worth of domestic bank debt was held by Italian households. New European Union rules, which came into effect on 1 January and impose losses upon shareholders and large depositors before recourse is given to public money, are scaring off potential investors. The number of bonds coming into the market is simply too high for the ECB’s bond-buying program to make a significant dent in the problem. For its part, the European Union has been ineffective thus far in helping Italy attack its NPL problem. Analysts at Mediobanca, an Italian investment bank, criticized the ECB, saying that it had already been collecting data for 18 months and that requests for even more information could produce uncertainty in an already fragile market. And because Italy is a member of the eurozone, it cannot simply print more euros and devalue its currency, as other countries might do in similar situations. In addition, the European Commission in October rejected an Italian plan to create a single “bad bank” that would have taken away all of the debts held by Italian banks. The twin goals in this plan would have been to encourage investment into Italy’s banks while creating a more efficient vehicle, backed by state guarantees, for selling the bad debt on the market. Italy has since proposed a new plan to the European Commission, and last week Italian Minister of Economy and Finance Pier Carlo Padoan said he hoped it would be approved soon. The new plan proposes to give Italian banks the chance to buy public guarantees, enabling them to offload their non-performing loans onto some kind of asset management company. The details are vague and the prospects for success unknown. Even if the European Commission approves Italy’s new proposal to tackle its NPL problem, the creation of any kind of vehicle to absorb the huge amount of assets that 17% NPL rates entail would affect the whole system’s ability to lend. Both of these Italian plans are attempts to shift the risk from the banks to the Italian government – which is precisely what new EU regulations try to prevent. The EU wants Italian debt holders and depositors to be the first line of defense, not public funds. There is also the question of whether the Italian government could absorb the risk of all these loans failing. The latest estimates from the Bank of Italy (released last week) put the total value of NPLs in the country at €200 billion. According to Eurostat, Italy’s debt-to-GDP ratio is more than 132%, second in the eurozone only to Greece. The Italian budget passed in December is around €32 billion and is projected to run a deficit of 2.4% of GDP. These realities are bringing Italy in direct conflict with the EU, specifically with Germany. The deficit projections for Italy’s 2016 budget exceeded the previous target of 1.8%, and the EU is planning to review Italy’s budget targets at some point in the next six months. Brussels is trying to impose strict financial targets on Italy. This is in many respects the German way. The same Germany that demanded Greece swallow difficult austerity measures last summer is displeased with an Italian budget that is simultaneously exceeding deficit targets and cutting taxes. Both sides have reasonable demands. Italy wants the EU to support it in a particularly challenging time. Germany does not want to be held responsible for what it sees as another country’s profligate lending. Italy and Germany are finding their interests diverging, as Germany demands Italy rein in spending and opposes the creation of an EU-wide bank deposit insurance scheme and both countries argue about appropriate next steps for Europe’s migration crisis. This makes Italy’s banking woes not just an Italian problem, but a political problem for the EU, and in particular for Germany, neither of which can afford to see Italy’s banking system collapse. The core problem is NPLs, and Italy has no solution yet. At least 17% of Italian loans are non-performing, and some estimates are as high as 21%. The ECB says that it randomly chose some Italian banks from which it wanted more information, but one of them, UniCredit, has had to cut jobs and propose asset sales to boost its stability in the eyes of financial regulators, and another, Monte dei Paschi, holds 22% NPLs and has watched its shares nosedive over 46% so far in 2016. So it may have chosen randomly but the assertion rings hollow. In our 2016 forecast, we noted Italy’s banking problems would be quite serious in 2016, and that the degree of severity would depend on how quickly and effectively the rest of Europe could develop creative solutions. The current developments do not bode well and point to the possibility of repeating the Greece disaster on a much larger scale.